EMC is a bear of a company to get your arms around. So let’s throw in another big global company, plus the world’s most populous country, and see where that gets us. Yes, Hopkinton, MA-based data storage giant EMC (NYSE: EMC) announced yesterday a far-ranging partnership with personal-computer maker Lenovo (HKSE: LNVGY), which has dual headquarters in Beijing, China, and Morrisville, NC. The upshot of the multi-year deal is that the companies will work together to develop and sell servers and storage systems through their respective channels and in their respective markets—in particular, China for Lenovo. EMC and Lenovo also have set up a joint venture, based in various locations around the world, to develop network attached storage technology for small and medium-size businesses. No financial details or headcounts were given, but Lenovo chairman and CEO Yuanqing Yang said in a press conference that the total value of the partnership would be measured in “billions” of dollars, not millions, over the coming years. 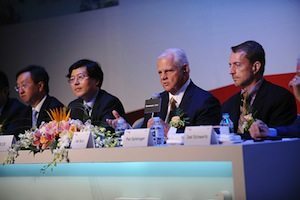 The conference in Beijing (see photo above) also included EMC’s chief executive Joe Tucci and president Pat Gelsinger, who will become VMware’s CEO next month.